As hard as it might be for Apple's smartwatch market competition to catch up to the life-saving technology enabled on the Series 4 not that long ago, companies like Fitbit and Samsung are actually well ahead of the Cupertino-based tech giant when it comes to a feature many wearable device owners probably consider to be quite useful. We're talking about sleep monitoring functionality, which has been present on low-cost activity trackers from Fitbit or Garmin for a long time now. Recent Apple Watch-rivaling smartwatches like the Fitbit Versa, Samsung Galaxy Watch, and Galaxy Watch Active all support the feature out the box as well, which is bizarrely not yet the case on the world's best-selling line of wearable gadgets. 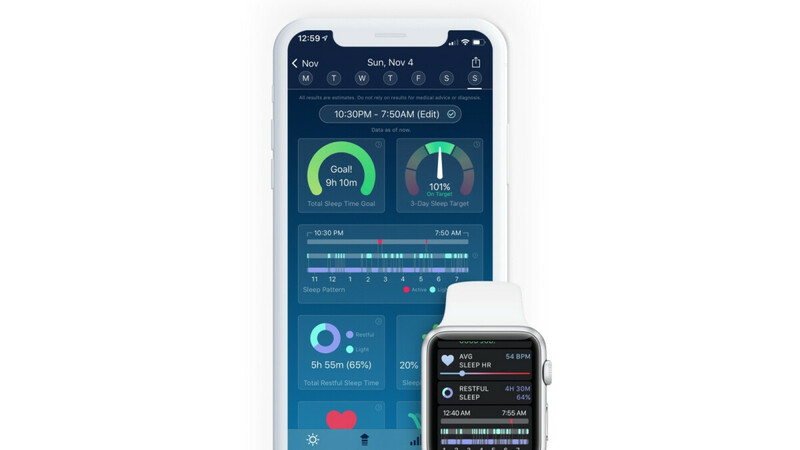 Instead, Apple Watch Series 4 users need to download a third-party app like Sleep Watch by Bodymatter to get the device's sophisticated hardware to automatically register your sleep duration and rest patterns, which can often help you understand why you're so tired all the time and what you can do about that. Sounds like a great health-improving tool, which is why it's nice to hear Apple is finally getting ready to bake something like that into its Watches by default in the not-too-distant future. Specifically, "by 2020", according to Bloomberg's typically reliable inside sources, basically meaning this year's Series 5 or next year's Series 6 should implement the feature for the first time. This doesn't come as a huge surprise, and not just because everyone is doing it in today's smartwatch landscape. Apple actually acquired a little company called Beddit a few years back, selling its standalone sleep monitors directly through the Apple Store for $150 a pop. While that's an entirely different product from the sensors needed to enable sleep tracking on an Apple Watch, sitting in bed with you and sending all the data it registers to your iPhone, the acquisition was long rumored to be about much more than that. Unfortunately, we don't know exactly what Apple intends to do to stand out from the pack when it eventually joins the sleep-tracking-from-the-wrist game. As the technology is reportedly still in the testing stages, we can assume the company is trying to polish a more complex and reliable set of tools than the competition. After all, current sleep-monitoring wearables can be wildly inaccurate to the point the feature is essentially not worth using or paying a lot of attention to. Perhaps Apple can change that... somehow. loving my apple watch but i dont care about the other features in next iterations. all i care now is a longer battery life. This is what Wear OS has been missing as standard & the main problem with Wear OS, so may dismiss this because of Battery life, but thats an excuse, battery like on most wear OS watches can last a full 24 hours & sleep tracking does not use as much as some think. Maybe in the far future Apple Watch (the best smartwatch according to most) will be able to tell also always the time, show notifications complete with attachments and get a less geeky design with better materials. Sleeping with a watch on, is so uncomfortable. I'd never use that feature. This is not news. Apple is always 2 (or more) years behind on important features.